What’s a Wassail you ask….???? Wassail in the County echoes the age-old tradition of celebrating the harvest before the arrival of winter. In medieval times, revelers would sing songs at neighbours’ houses and receive food and drink in return. In Prince Edward County, the grape vines are buried at the end of the season to withstand the cold winter. Once that job is done, the party starts and you’re invited! Enjoy mulled wines and comfort foods, shop for wine and wine-related gifts, or choose from local handmade crafts and other gift items. Sing carols in front of a giant Christmas tree, or celebrate Festivus – the anti-Christmas day made famous by the TV show Seinfeld – with an airing of grievances and feats of strength. Go for a hike in the vineyards, and roast marshmallows or make s’mores over the fire upon your return. See barrel toasting and firing demonstrations, or tour a barrel cellar. Make a grape vine wreath! You may even see Mr. and Mrs. Claus! 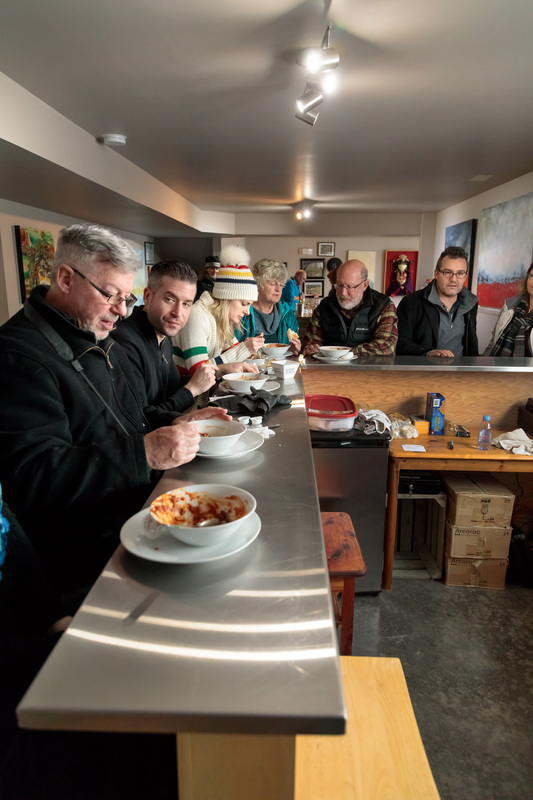 Savour tasty stews, pot pies, spaghetti, chili, tourtiere, local charcuterie, cheese and more. Broken Stone Winery has tourtiere, a traditional Quebecois meat pie, and live entertainment each Saturday; Black Prince Winery teams with Canadian Vinegar Cellars and cooper Pete Bradford for barrel toasting and firing demonstrations, vinegar tastings and wood fired pizza; By Chadsey’s Cairns offers mini beef Wellingtons, roasted chestnuts and mulled wine. At Closson Chase Vineyards they will have a truffle dinner at The Ridge on November 24th with chef Zach Littlejohn; roast marshmallows over the fire pit at Del-Gatto Estates; tour the vineyard and barrel cellar and meet the winemaker at Domaine Darius. County Cider Company invites you to walk the orchards and see the best view in The County. 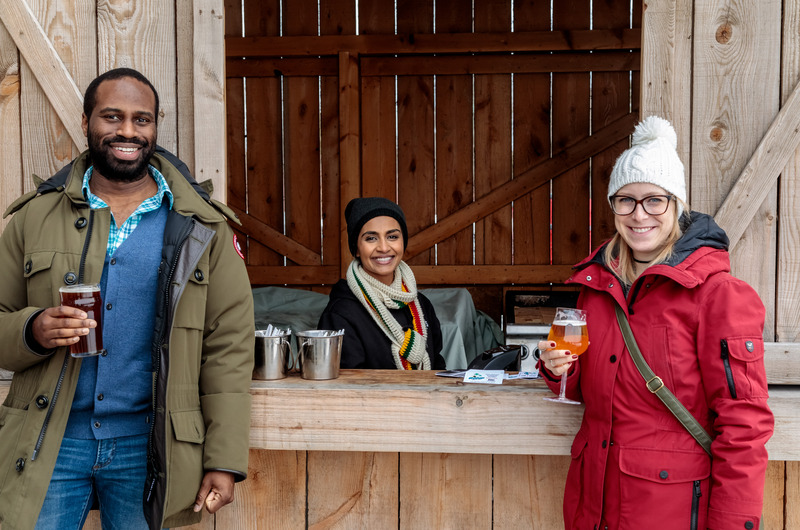 Grange of Prince Edward Winery will have delicious Mexican food, and crafts by Kelly’s Cork Creations; at Gravel Hill Vineyards you can feed Hermione, Herschel or , the trio of baby doll sheep responsible for keeping the vineyard weed-free, or pet a chicken or go for a hike. Walk in the fossil-laden vineyard at Half Moon Bay Winery and check the stone piles for signs of ancient life. Many artisan products are available at Harwood Estate Vineyards and Winery including olive oil, spices, cheese, meats, shortbread and wine socks; Hillier Creek Estates offers an assortment of Christmas baked goods, gift baskets, and a variety of foods and wines. A full Wassail lunch menu is available at Huff Estates Winery. Karlo Estates will be featuring the vegan cheeses of Fauxmagerie Zengarry, Stokes Cheese and The County’s own Caju Winds each weekend. Enjoy shortbreads at Keint-he Winery, and braised beef stew at Lacey Estates. Find locally-sourced cheese, charcuterie, preserves and gift ideas at Rosehall Run Vineyards. Tour the vineyard, taste local cheese or take a wreath-making workshop at Sandbanks Winery; sample pot pies at Stanners Vineyard. 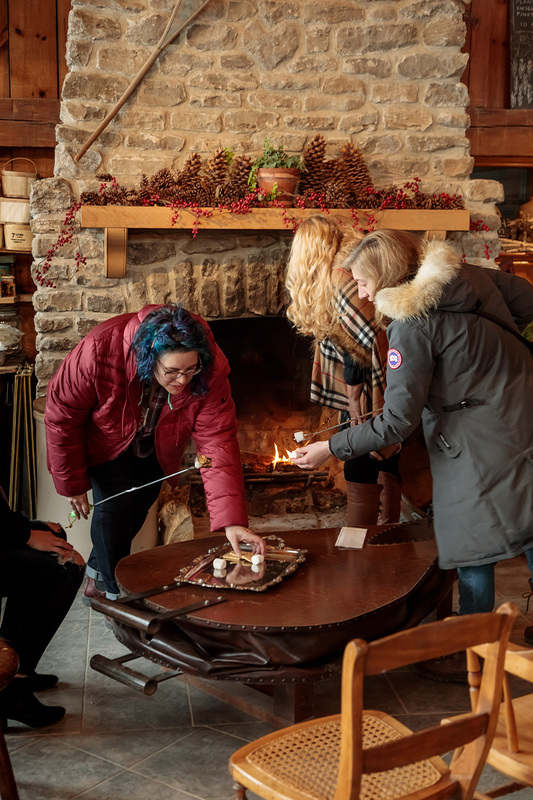 Sugarbush Vineyards features home-baked goodies, maple fudge, chili bowls, s’mores kits, Christmas gifts, red cedar ornaments, as well as knitted mitts and hats. Sample Baco-braised beef stew at Trail Estate Winery. Enjoy a cocktail or mulled wine next to a campfire on the patio at Traynor Family Vineyard, and meet Mr. and Mrs. Claus Saturday afternoons. 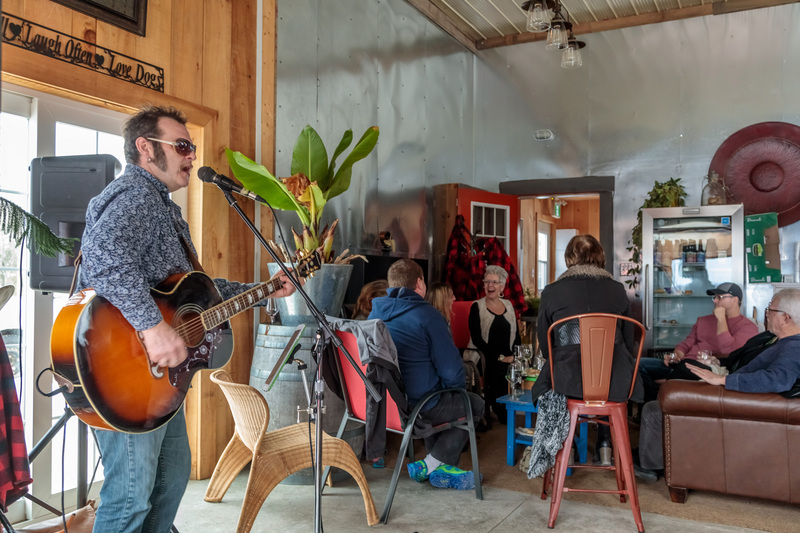 For something completely different, celebrate Festivus for the Rest of Us with live music at Three Dog Wine — air your grievances and demonstrate feats of strength! 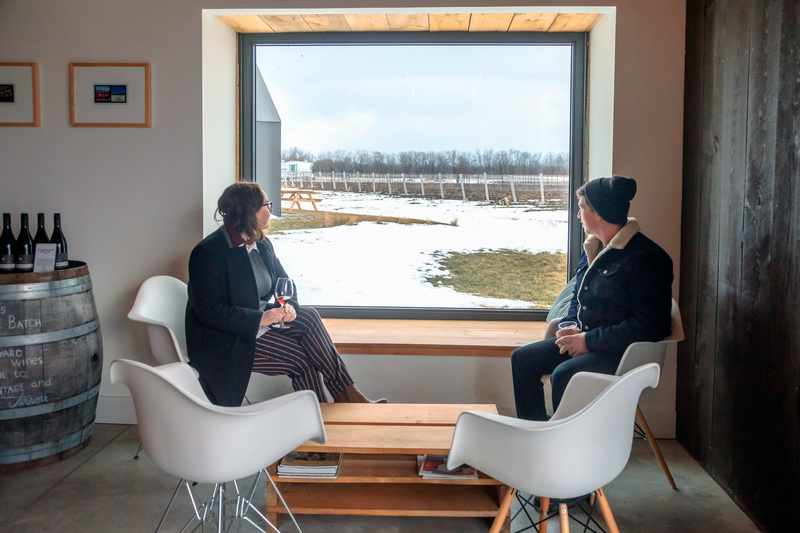 At Waupoos Estates Winery, walk down to the dock for views of Lake Ontario, visit the farm animals, or simply enjoy the vineyards and orchards . 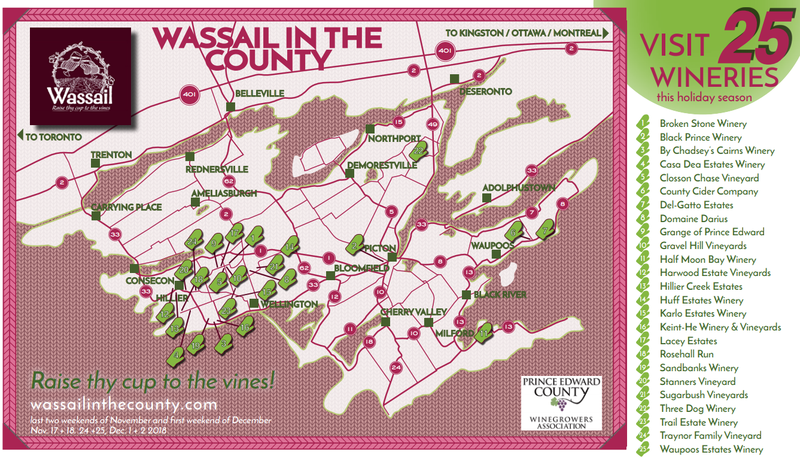 Wassail your way through The County during the last two weekends in November (17 & 18, 24 & 25), and December 1 & 2 as our winegrowers celebrate the end of the season with festive good cheer! Wassail ye all!